Manchester United are set to revive their interest in an Atlético Madrid player, but it’s not Antoine Griezmann. The Red Devils have long been linked to the French forward in recent years, but it seems that door has since closed since the signing of a new, improved deal at the Wanda Metropolitano. 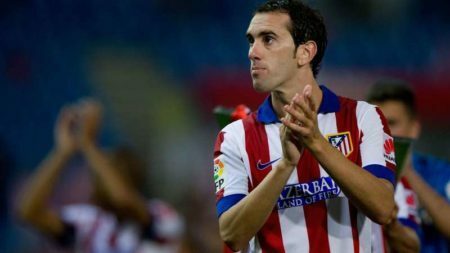 The Mirror suggests that Jose Mourinho is keen on a move for Griezmann’s teammate, Diego Godin. The veteran centre back was the subject of a transfer deadline day move to Old Trafford, though the deal failed to materialise with the Uruguay international allegedly signing a new contract with the Madrid-based side. United manager, Jose Mourinho had been vocal about his need for a new centre back in the summer, and it seems his concerns were well-founded, as United have conceded a whopping 21 league goals, just 7 less than they let in over the whole of last season. Despite talk of Godin signing a contract extension with Atleti, it seems as though he is yet put pen to paper, as his representatives and the club’s have apparently been locked in talks for the past few months. This has reignited United’s interest in the 32-year-old, widely regarded alongside Sergio Ramos as the best central defender in the world. Godin reportedly has a £22m release clause in his contract, which United will look to activate in January. Atleti do not want to let Godin go on a free, but as talks continue to be drawn out, they could be tempted into selling him in January to avoid losing him for nothing. Godin is an uncompromising, hard-as-nails defender known for his leadership ability, intelligence and astute reading of the game. He joined Atletico in 2010 and has established himself as a club legend, scoring 24 goals in 364 appearances.